Now we all know who the younger children are. I mean, this isn’t exactly rocket science, is it? 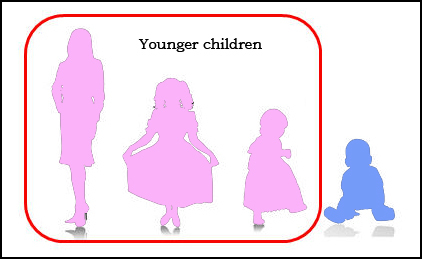 For there to be younger children, you need (a) more than one kid and (b) one of them to be older. You see, in English law, the term had a very specific meaning and took into account that there was one child who got a little bit more from his position in the family, no matter where he was in the birth order. And yes, I’m using the pronoun “he” deliberately… we’re talking here about the oldest son. Remember that in English law, the oldest son got all the marbles when it came to the family land. Under the rule known as primogeniture — the right, by law or custom, of the firstborn son to inherit the family estate, in preference to siblings1 — the oldest boy inherited, even if he wasn’t the oldest child. So here, with a family of four, three girls and then the youngest, a boy, you can see… the younger children. Note: This topic was originally covered in 2013. But hey… it’s still useful! This practice is called Borough English. Perhaps a reason for this practice was that older sons had received their portions of the inheritance prior to the father’s death, as they married and formed their own households. This left the youngest son, who had stayed on the home farm to work with the aged father, as the only man who had not already gotten anything. A more common departure from primogeniture was for all SONS to inherit intestate estates equally. This was especially the case in some parts of Kent. This practice was known as gavelkind. So…I looked up the Gavelkind and borough-english blog. Borough-english is what happened in my family back in about 1823, the youngest son, my ancestor, inherited the family farm from his father. We always figured the other sons, quite a bit older, had already left and were on their own somewhere, maybe with help from their father already. Now, I am going to relook the probate/will for mention of maybe why my ancestor got the farm. Thank you Judy and Chad for the tip!